Operators can now use the TrendPro tool in FactoryTalk View Site Edition (SE) software to overlay alarm information on trend data. This feature can help them connect alarm occurrences with data-point values to speed up troubleshooting. They can also use the tool to save and share ad hoc trends with other workers. FactoryTalk View SE v10.0 also integrates the ThinManager software login into the FactoryTalk View platform. In the past, users had to separately log in to both systems. Now, they can bypass the second security point with an automatic login pass-through for easier and faster operations. 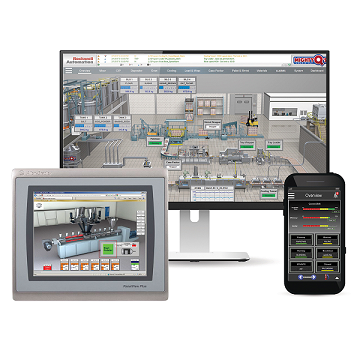 For process industries, the FactoryTalk View SE software introduces an abnormal situation management (ASM) multi-monitor framework. This feature allows operators to see different levels of data across multiple screens in accordance with standards-based ASM guidelines. It can also provide operators with more viewable information, helping them more efficiently run and maintain their systems. The updated FactoryTalk ViewPoint software, which extends the FactoryTalk View SE software to mobile devices, now supports recipe management. This update allows workers to view and download recipes on the device of their choice. And now, with ViewPoint v10.0 software, FactoryTalk Alarms and Events alarm history is also available on their mobile devices. The FactoryTalk View Machine Edition (ME) software v10.0 adds design-time and run-time enhancements to improve user efficiency and productivity. The HMI software now better supports restoring and upgrading legacy projects and improves usability when editing displays. Allen-Bradley, FactoryTalk, LISTEN. THINK. SOLVE. and ThinManager are trademarks of Rockwell Automation Inc.